While I am a self-declared "urbanist", this does not mean I think everyone should live in a Manhattan or a Chicago (or even Des Moines). This post will discuss my approach to urbanism and why I actively promote urban policies and urban (re)development. Normally to start a post like this, I would do a quick Google search for "urban" and check out what other people think an "urban" is. It's a standard timesaver used by the net generation - no need to reinvent the wheel (many blog posts are reactions or responses to something that already exists). As an aside, this approach isn't new. How many high school essays start out "Webster's Dictionary defines [my topic] as..."? However, for the purposes of this exercise, I am forgoing that maneuver. I'm going to start from scratch and see where "urbanism" takes me. Keep Out of My Fountain! Don't Even THINK About It!This fountain is located at the entrance to the Country Club Office Plaza in West Des Moines. Evidently the idea of fun doesn't sit well with their insurance company. 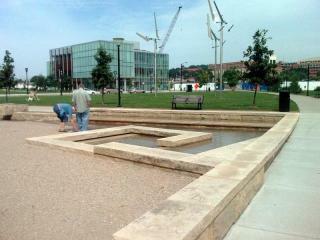 The big brown sign on the fountain reads "NO TRESPASSING" in big bold helvetica. This is a great example of how suburban developments use representational ideas (a fountain) designed to make people feel comfortable. When you drive past at 45 miles per hour, they often work as intended. A closer examination, however, can lead to the discovery of awkward conflicts. 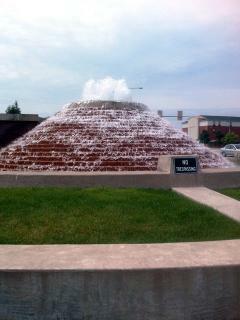 What could be more inviting than a fountain on a 90 degree day? But.... place that fountain 15 feet from a six lane automobile thoroughfare and it looses a bit of appeal. A large sign shouting "NO TRESPASSING" takes away a little more appeal. Placing it between a fast food drive-thru and an automobile-oriented bank building kills whatever remaining appeal the fountain had. Fountain at Downtown LibraryThe fountain outside the downtown branch of the Des Moines Public Library is an excellent example of a public amenity. Note the walls at multiple levels (perfect for sitting on or walking along) and the zero grade entry for accessibility. It is clearly designed to encourage passers-by to slip off their shoes and linger.